All 2012 birds are sold. 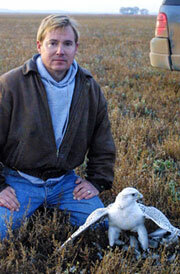 My passion since childhood has been falconry. Many life choices have been driven by the unflagging desire to experience this ancient art/sport in its fullest. I have a Bachelor of Science degree in Wildlife Biology, Kansas State University, 1979. I did my senior thesis on the subject of imprinting and have used this information on our own birds which are often artificially inseminated to produce either hybrids or purebreds. My passion for raptors has led to a respect for the one of the ultimate longwing quarries, grouse. I have spent many hours observing the fascinating mating rituals of my local grouse, Tympanuchus cupido, the greater prairie-chicken. I have been to the far corners of the earth studying animals and consider the lekking (mating) behavior of this dwindling species to be the most intriguing in the entire animal kingdom. Please consider a contribution to help save North America's grouse species via the North American Grouse Partnership.